Marie has too many scandals on her head to be taken seriously in Denmark. Just one off her mistakes was to lie about having af business degree and a career as she really hasn't been able to manage anything but breewing coffee in her stepfathers firm. Well then, Marie is a living example of someone who was lucky enough to brew the coffee at the right time and right place to catch a prince, even without a real degree and career. Marie has a degree. I can't say much for the career, but the degree is legit. Agatha turned out to be a Mary troll, so I would take whatever she posted with a ginormous grain of salt. Princess takes over protektionen by Her Majesty the Queen, who has performed this function since 1972. "It has been invaluable for the Danish Student in Paris, the Royal Family for many years has fueled great interest in the institution. We are grateful to Her Majesty the Queen's efforts and look forward to future cooperation with Her Royal Highness Princess Marie "says Chairman of the Board, lawyer Mette Forest. The Danish Student is an active, independent part of the international student city of Paris - Cité Internationale Universitaire de Paris - which was founded in 1925 and whose overall purpose, in addition to providing students with the best possible housing, is to promote interaction and understanding between young people from all countries to contribute to peace and harmony among countries. With today 37 colleges annually hosts small 10,000 students from 145 different countries, a stay in Student city via Student House as a unique opportunity to take lifelong benefits of cultural diversity, the area offers. Above one of the Architect Kai Gottlob original drawings of student housing, dated the 1930th picture at the top of the page comes from the house's inauguration in 1932 in the presence of HRH Crown Prince Frederik, the future King Frederik 9th. The Danish Student was built with funds collected by the Committee of the Danish Student in Paris. The house was, as the other colleges in Student city, by deed of gift of 7 March 1929 transferred kansleriet for the Parisian universities, whose main task in this context is to ensure that student houses could never be used for purposes other than those specified in the deed of gift set. The Danish Committee has since the beginning served as Student House Board of Directors. Through funds raised from private sources and through an annual grant from the Ministry of Education, now Ministry of Science, Technology and Innovation, the provision of adequate funds for house operation, renewal and maintenance. H&H seem to be farming out ALOT of their patronages. delighted for Marie, there is only so many patronages in Denmark , and it's great that Henrik has confidence that Marie can take over and do a good job. Its good too that M&H realise that they getting older and can delegate. In February 1972 it was joyfully announced what was then the magazine that the HRH Prince Henrik had been patron of the Danish Epilepsy Association . With as much a pleasure to Danish Epilepsy Association now announce that HRH Princess Marie takes over the protectorate. "We have been very pleased to have had the HRH Prince Consort, as patron. And I am grateful for the 40 years of shared history we have had together", said Danish Epilepsy Association's national chairman, Lone Noerager Kristensen. "At the same time, I welcome HRH Princess Marie warmly welcome our new patron. I know many that its members already have a soft spot when it comes to HRH Princess Marie , after her participation in the celebration of the Danish Epilepsy Society's 50th anniversary at Odense City Hall in 2012. Here she left all present with an impression of a princess with both a personal commitment and a sincere interest in epilepsy case". "Like HRH Prince Henrik has done so I hope and believe that HRH Princess Marie will help to raise awareness about epilepsy and Danish Epilepsy Association's work. There is a need for much more awareness of epilepsy, affecting 55,000 residents' daily lives. Of this large group, each third of them do not become seizure-free with the available treatment options. And we know that many especially in this group can be very difficult. Epilepsy can be very significant due to problems, so we need all the attention we can muster in order to create the best possible treatment and living conditions for the whole group", concludes Lone Noerager Kristensen . HRH Princess Marie is the new patron of Kattegat Center. 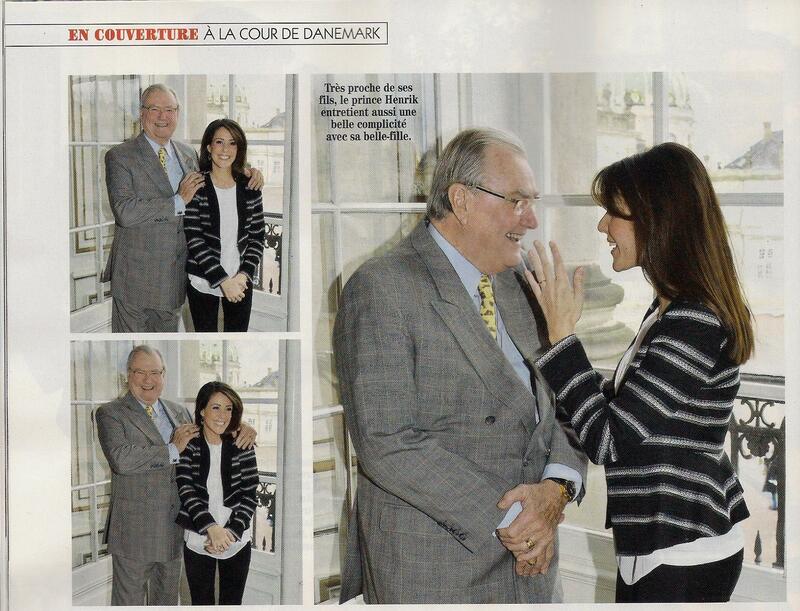 Princess Marie has assumed the patronage of the Kattegat Center on November 2013. The Princess thereby continues the patronage from HRH Prince Consort, who has been patron of the Kattegat Center since opening in 1993. The princess has already tried her hand at the active experiences at Kattegat Center, when she opened the Kattegat Center's new experience zone "Sea in Action" in May 2013. During the visit in May the Princess was engaged and interested in the new arrangements. For example, the princess took a virtual tour of the center's sea kayak from the North Pole to the South Pole and came close to including icebergs and leaping dolphins. HRH The Prince Consort was patron of the Kattegat Center since its opening in May 1993 to November 2013. Prince Consort's last visit to Kattegat Center patronage was on 4 September 2013. Prince Consort is clearly fascinated by sharks, and he was impressed with Kattegat Center's work with the training of tropical sharks and interested in hearing about Kattegat Center's experience and the attention the center has received from home and abroad because of the training of the sharks. New this year at Kattegat Center was the experience "Sea in Action". The interactive shark model was carefully tested. "The sea in Action " was opened by the Prince Consort's daughter-in-law, Princess Marie in May this year. The Independent Order of Odd Fellows (IOOF), also known as the Three Link Fraternity, is a global altruistic and benevolent fraternal organization derived from the similar British Oddfellows service organizations which came into being during the 18th century, at a time when altruistic and charitable acts were far less common. The word "Independent" in the organization's name was given by the English parent organization as part of the chartered title in the new North American chapter: The Independent Order of Odd Fellows was founded on the North American Continent in Baltimore, Maryland, on April 26, 1819 when Thomas Wildey and four members of the Order from England instituted Washington Lodge No. 1. This lodge received its charter from Manchester Unity of Odd Fellows in England. Teachings in the Order are conducted through the exemplification of the Degrees of membership. The Degrees are conferred on the candidate by their Lodge, and are teachings of principles and truths by ceremonies and symbols. The Degrees are presented largely by means of allegory and drama. For Odd Fellows, the degrees in Odd Fellowship emphasizes a leaving of the old life and the start of a better one, of welcoming travelers, and of helping those in need. Lodges also provide an international social network of brothers and sisters that extends to more than 26 countries worldwide. If travelling is an interest, membership can provide a valuable network that will very much welcome an international visitor, and assist in their enterprises, and certainly their travels wherever possible. The command of the IOOF is to "visit the sick, relieve the distressed, bury the dead and educate the orphan." --> To improve and elevate the character of mankind by promoting the principles of friendship, love, truth, faith, hope, charity and universal justice. --> To help make the world a better place to live by aiding each other in times of need and by organizing charitable projects and activities that would benefit the less fortunate, the youth, the elderly, the environment and the community in every way possible. --> To promote a wholesome fraternal experience without violence, vices and discrimination of every form. * Annual pilgrimages to the "Tomb of the Unknowns" (Arlington National Cemetery, USA), and other Tombs of the Unknown Soldier. ~ One of the strongest fraternal societies in the world. ~ A great worldwide united brotherhood. ~ A fraternity founded on the basis of universal brotherhood. ~ Based on the Fatherhood of God and the brotherhood of man. ~ Founded on the North American continent in 1819. ~ Based upon the purest principles of equality. ~ A source of comfort in times of trouble and adversity. ~ A world-wide force that stands for all that is noblest and highest. ~ An everyday guide for conduct, a mantle that should be worn always. ~ An organization that favors no person for their wealth and frowns on none for their poverty. ~ An ideal that exists in the heart and mind of every genuine Odd Fellow or Rebekah. ~ Fulfilling a mission in the world which no other institution has successfully attempted. ~ A vitalizing, sympathetic, and actuating influence in the lives of all its real members. ~ A ministering spirit succoring the needy, cheering the despondent and protecting the helpless. ~ The handmaid of virtue and religion. ~ Founded on the inspired word of God as revealed to man in the Holy scriptures. Several theories aim to explain the meaning of the name "Odd Fellows". One says that they were called "odd" because in the beginning of Odd Fellowship in the 18th century, at the time of industrialization, it was rather odd to find people who followed noble values such as benevolence, charity and fraternalism. She always starts out working behind the scenes - then one time events - and later it is announced as patronage.....Hmmm, will be interesting to find more out about that. > Discover, enjoy and understand your Danish heritage. Become a fan of our Los Angeles-based organization. > The mission of the Danish Sisterhood is to strengthen, maintain and preserve the Danish heritage and traditions for future generations. > We are a Los Angeles area lodge of the Danish Sisterhood of America, California District. HRH Princess Marie enters into a partnership with the First European School Copenhagen to help strengthen the awareness of the school's educational and other activities. European School Copenhagen is a new multilingual and multicultural international school with a focus on language and science from school starting age through high school. The program is concluded with the European Baccalaureate. The cooperation has among other things, to help strengthen the awareness of school education. European School Copenhagen will be affiliated with St. Annæ Gymnasium with a joint board and the president, but in the daily work have its own management. European School Copenhagen is the first European School in Denmark and will be housed at the school in the South Harbour until 2018. The official opening of the school will take place Wednesday, August 27, 2014, the Princess along with Education Minister Christine Antorini, Mayor Frank Jensen and kids - and YPM Pia Allerslev will participate. - "It is with great pleasure and pride that I can announce that Her Royal Highness Princess Marie has agreed to cooperate with the European School Copenhagen", says the new school's headmaster, Paul Nygaard Markussen. - We are very pleased to say that the new international school will start on August 14 with 92 pupils from around the world with small classes in Nursery and Primary 1. I'm sure the Princess engagement can help to strengthen the national and international focus on understanding Danmark's School. WOW it's a great privilege and sign of her acceptance that she is actually representing Danish women in the USA! She is probably pretty fluent in Danish I would think, by now? Marge must be really, really proud of her daughter-in-law! Do you think that Marie, given that she is the patron, will enrol her two younger children in the European School Copenhagen? It is a sign of Marie's growing confidence that she takes on more patronages. I don't think that Marie is growing, necessarily. Growing into what? She speaks Danish fluently at this point, with the littlest, or almost no accent. She is established in her married family. I think she chooses patronages very carefully in order to give them maximum time and expertise. She knows where she can be most valuable and supportive. That's how I see it anyway.